You are here: Home / Tutorials / How to Highlight a Surface? How to Highlight a Surface? There are many different ways to highlight any given surface. I like to trim all the fat and leave only the necessary steps. It won’t give you breathtaking result, but is fast, reliable, fairly easy to learn and good looking technique. I encourage you to give it a try to judge for yourself. What’s the role of paint consistency? Using right paint consistency is one of the most critical issues. I’m guessing that is one of the biggest problems that new painters struggle with. Consistency is important, because creating smooth color gradient requires applying lots of paint layers with different translucency. You can achieve different states of translucency by adding more water to the paint. 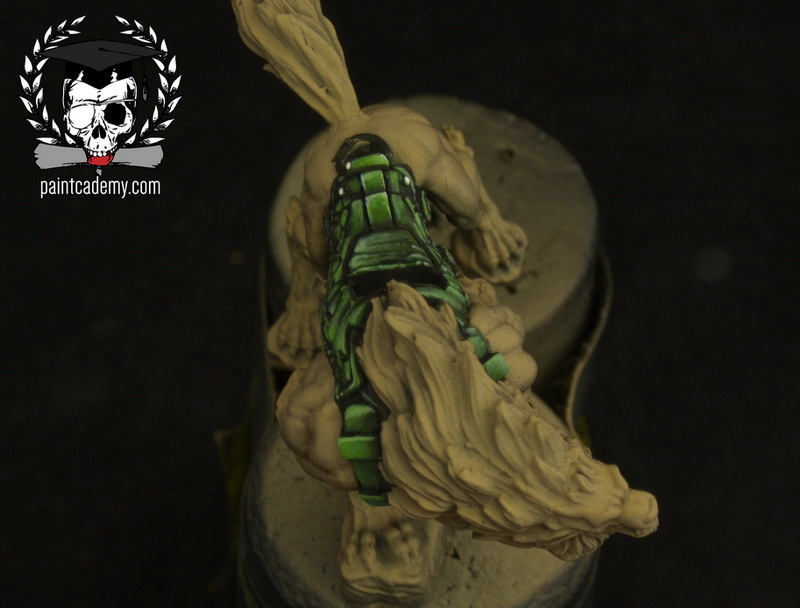 Using different color tones is one aspect of highlighting, but within that you’ll need to operate with layers of translucent paint. In theory you could highlight the model just by applying paint of the same consistency just going with brighter tone. Unfortunately, result won’t be pretty and it’s very time consuming. Paint’s color tone is destination and paint’s consistency is the way. You can learn how to test paint consistency in this article. How to determine color tones for that purpose? I won’t go into details choosing between different colors. In the topic of highlighting you should be interested in color tone or color brightness. Creating a color scheme is a different topic. If you are choosing color tones for olive green you can choose everything between “almost black olive green” and “indistinguishable from white olive green”. Of course, number of possibilities is near infinite. As in the other cases I’ll need to reduce number of available options to something manageable. That’s why for the default I almost always go with three. I would like to show you the process on the example of olive green. You can achieve this by mixing medium color (olive green) with black and white or by buying different paints. Either way this approach gives you five color tones to play with. You can reduce them even further by dropping black and white. I’ll call them from left to right: Black, Dark Tone, Base Tone, Bright Tone, White. How to apply prime layer? First of all you need something to start you work with. Prime layer is nothing fancy, but it give you strong base to work with. If you are painting new color that is very different with airbrushed base you should start with something very dark. This is very good opportunity to practice staying within the lines. How to apply first highlight? You should start highlighting with fairly thin paint. The most important thing you should always remember: color will be stronger where you end your brush stroke. Practice starting your brushstrokes near the darkest place and finishing them where the highlight should be the brightest. If the result isn’t bright enough, you can do more layers. You can’t go wrong with thin paint. How to apply second highlight? Applying routine stays the same. You should start higher, so some of the previous color remain visible. If you make any mistakes you can use previously used colors to cover them up. Remember about brush strokes and be patient. How to do finish up highlighting? In the topic of surface highlighting it’s totally optional step. Although, in the normal painting routine you’ll use it very often, so I decided to include painting the edges. Pick one side and paint the edge as carefully as you can, using side of your brush. Notice that I’m doing few motions before actually touching the model. This was a great post! I enjoyed this new style with the gifs! Keep it up!